VAMMI: Van McCoy Music, Inc. The Starlighters. The young quartet that started it all for Van’s musical legacy. Listen to the Starlighters in our discography section. Purchase their work in our store. The genius of his music still lives and continues to delight and inspire people all over the world. 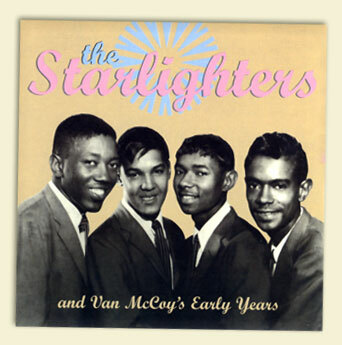 Van’s musical venture started when his brother, Norman, Jr. and a few high school buddies formed a street corner singing group called the Starlighters. Van became the lead singer, writer, and music director for the group. They quickly moved from school programs and talent shows to recording their first 45rpm single, The Birdland, named for a popular dance of the late 50s. The group appeared on stage in Washington, D.C. (Howard Theater), Philadelphia (Royal) and New York (Apollo). Vi Burnsides, a musician from the famous Sweethearts of Rhythm all female band, took the Starlighters with her to enhance her performance tours on the east coast corridor. This gave them their first exposure to audiences in theaters and stages in major cities away from home. The Starlighters ended as military draft, marriage and college called them away one by one. Van, who had entered Howard University, left after two years and moved to Philadelphia, and later to New York, to begin a serious music career. The late Reginald Morrison, a local building contractor and relative of a Starlighter backed his first solo music venture. Jocko Henderson, a popular Philadelphia Disc Jockey, was the first to play Van’s records and later formed Vando Record label with Van. Van was hired by the late Florence Greenberg as a staff writer at Scepter Records. He worked with Messrs. Lieber and Stoller and with writer/producer, Clyde Otis. David Kapralik, A&R at Columbia Records, hired Van as a songwriter with April Blackwood Music. Van wrote hits for Chad and Jeremy, Ruby and the Romantics, Irma Thomas, Nancy Wilson, Barbara Lewis and others. He also formed the original Peaches and Herb duo. Impressed with the smooth and mellow quality of Van’s own voice, Columbia’s famed, “Mitch Miller,” produced an album of beautiful ballads sung by Van McCoy. Nighttime is Lonely Time, is now a collector’s item. Van continued with his real love, writing and producing music for other artists. He wrote for Aretha Franklin, Gladys Knight and the Pips, Roberta Flack, Vikki Carr, Tom Jones, Nina Simone, Jackie Wilson, Gloria Lynn, Brenda and the Tabulations, Nat Cole, Melba Moore, Stacey Lattisaw, David Ruffin, The Shirelles, Chris Bartley, Chris Jackson, and the list goes on-and-on. He wrote some of the music for TV classic, Woman Called Moses, the story of Harriett Tubman. Mae West, the legendary actress, produced and starred in her own movie, Sextette, and asked Van to write the theme song, and to make a cameo appearance in the film. He was a frequent guest on the Tonight Show and appeared on the Mike Douglas Show. His last eight years were spent in partnership with writer/producer, Charles Kipps in McCoy-Kipps Productions. Van formed the Soul City Symphony orchestra, and with singers Faith, Hope and Charity, produced several albums and gave many performances. In 1975 he recorded the Grammy nominated Disco Baby album with the Grammy winning, Gold single, The Hustle. The Disco explosion of the mid-70s propelled Van and the Hustle into a worldwide tour, and later to a great show at the Avery Fisher Hall in New York City. Van McCoy was overwhelmed by the sudden burst of stardom and life in the fast lane. He never got back to the mellow life and fun career he had so dearly cherished. The 39 year old star was stricken with heart failure in his fashionable home in Englewood Cliffs, New Jersey and died July 6, 1979 at Englewood General Hospital.